Kiev is on Fire | Be Kind. We're all in this together. “Glory to Ukraine!” the people declared. 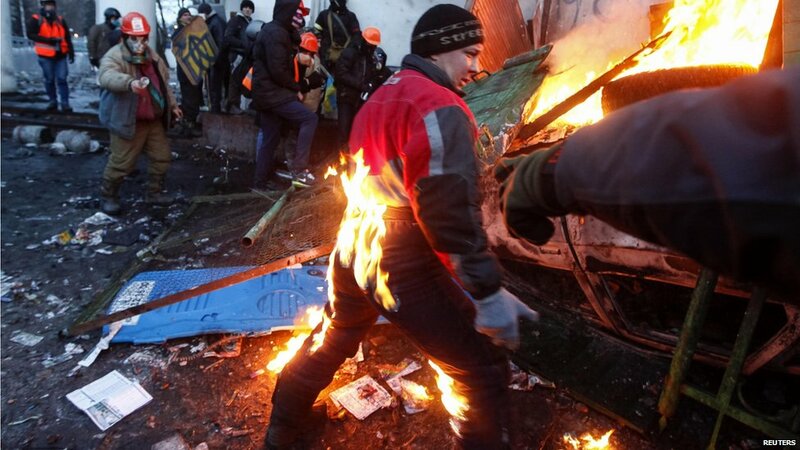 With flaming tires lighting up the night sky, thousands of riot police attacked a protest camp in Kiev on Tuesday. Eighteen people were left dead. In Independence Square, Orthodox priests prayed for peace. The Winter Olympic Games continue in Sochi as Vladimir Putin and the rest of the world ignore the fact that Kiev and its people are burning. This entry was posted in Uncategorized and tagged 18 people dead in Kiev, Kiev on Fire, Kiev Violence, Nancy Bragin, Ukraine Protests, Violent Protests Ukraine, Vladimir Putin, Winter Olympic Games Sochi. Bookmark the permalink. Tibetans have been setting themselves on fire for years… Not many know or understand especially when information is twisted and censored. Love that quote from Niemoller! I hope for a free Ukraine and a free Tibet.